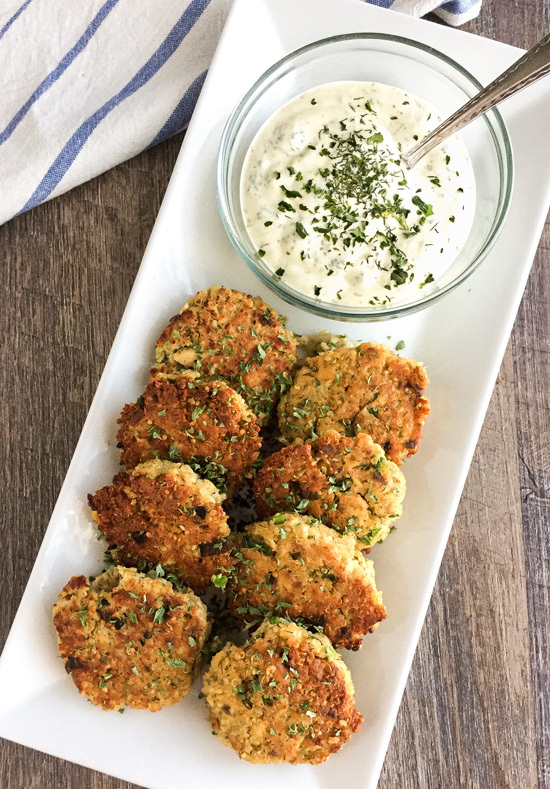 Gluten-free and delicious, these Quinoa Salmon Cakes make for an easy and healthy weeknight meal! 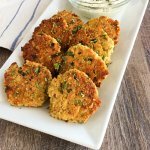 This recipe came about because I didn’t have my usual gluten-free crackers I needed to make my usual Salmon Patties one night. I did have some quinoa in my pantry though, so I decided to see how well that would work. Turns out, it worked great and we really enjoyed them. So much so, I decided they should be added to the blog. I always have canned salmon and quinoa on hand, so this is something I can whip up just about any time! I really like the Wild Planet Sockeye Salmon, but it’s pricey for a can of salmon, so I don’t always buy it. Sometimes, I’ll use a mixture of their sockeye and pink to save a little money. Or if I’m at Whole Foods, I might get their store brand pink salmon because it’s over a dollar cheaper. It just depends on where I’m shopping and what’s on sale at the time. If you just happen to have two cups of leftover quinoa, you could use that to make these. Sometimes, I’ll go ahead make extra quinoa or rice if I know I’m going to need it in the next day or two. If not, just plan ahead and cook the quinoa at least an hour ahead of dinner time, so that the quinoa has time to cool before making the patties. 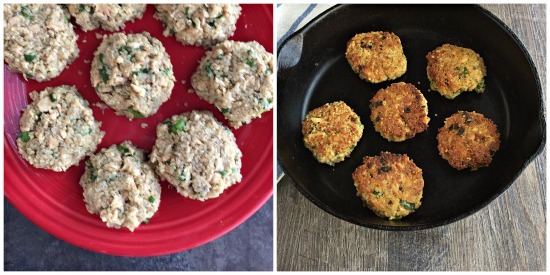 Tip: To portion out equal-sized portions, I used mounded 1/4 cup amounts of the salmon/quinoa mixture, then shaped them into patties. It makes it much easier to get them the right size. 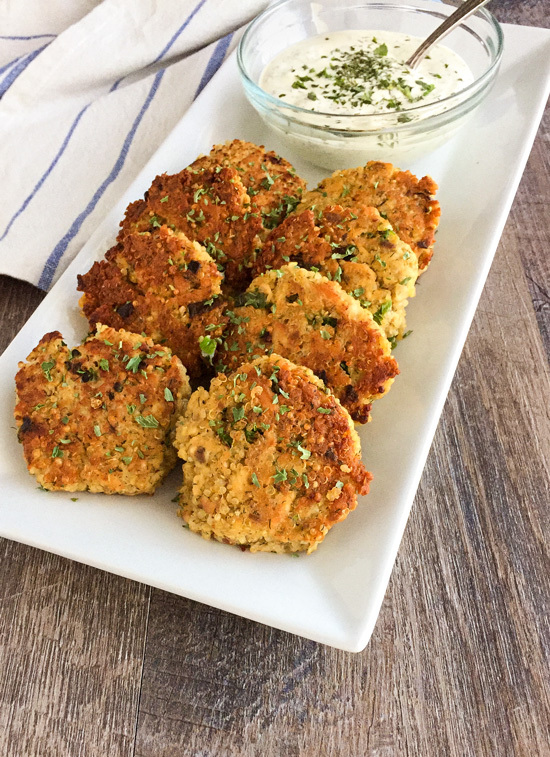 These Quinoa Salmon Cakes make a delicious and healthy main course for lunch or dinner. You could serve them with tartar sauce, but I think the Creamy Dijon Sauce pairs perfectly with them. The ingredients are all staples in my fridge, so it’s something I can whip up anytime, too. In a small bowl, mix together all of the dressing ingredients, cover and place into fridge until ready to serve. Can be made a day ahead. About an hour and a half before you want to make salmon cakes, cook quinoa according to package directions (omitting any salt), then spread out onto a cookie sheet to cool. In a large bowl, add the salmon and flake with a fork. Add the cooled quinoa, seasonings, and green onions to the bowl and toss to combine. Add the eggs and mix to combine. Shape into 10 patties. I took mounded 1/4 cup full amounts to portion mine out, then shaped them into patties. Heat 1 tbsp of oil in a large skillet over medium heat. Add half of the patties to the skillet and let cook until golden brown on the bottom and cooked through, about 3 1/2 to 4 minutes. Flip the patties and continue cooking for another 3 1/2 to 4 minutes. Remove from pan and place onto paper towel-lined plate. Add the remaining tablespoon of oil to the skillet and repeat with the rest of the patties. If using leftover quinoa, you would need 2 cups for this recipe. Troubleshooting: If mixture seems to dry, you can try adding an egg yolk or a tablespoon of mayo to it. I just made these today. Delicious! The quinoa gave them quite a nutty flavor. It really does! So glad you enjoyed them!